Somewhere between 400 and 800 people will lose their jobs when the Ringling Brothers circuses close this Spring, and perhaps their homes as well. An unknowable number of the Asian elephants who worked in the circus will be sold, will be sent to one of the very few large animal preserves in America, or sent to slaughter. It costs between $600 and $800 a day to feed an adult Asian elephant, and they live for 40 years or more. When I wrote about circus closings yesterday on my blog, I received, as I expected, a number of angry comments. The people who say they are for the rights of animals are not as enthusiastic about the rights of people to disagree with them. I was sorry to see that so many of them were ignorant of the issues they raised and knew little about the circus, the elephants, or their inevitable fate. One woman wrote that she was glad elephants would not be captured in the wild like slaves and torn from their habitats and families. Another said she understood all of the Asian elephants (shades of the New York Carriage Horse struggles) had homes to go to where they would be cared for for the rest of their lives. She could not name one. There is not one that can promise that. Another stated without any attribution (or justification) that Ringling Bros. had been convicted of gross abuse of animals. One man said he was delighted that the elephants could now return to the wild. Another said using animals to entertain people ought to be a crime punishable by time in jail. Of more than 125 comments, not a single one mentioned the circus workers or trainers, or expressed any concern about what might happen to them. Nor was here much worry expressed about the elephants themselves, just vague and very unspecific suggestions that someone, somehow, would take care of all of them forever. This is, sadly, for animals and people, not a movement that takes any kind of responsibility for what it does. The facts are this: the circus elephants are not captured in Asia, almost every one was born here, and has lived in the circus and among trained trainers all of their lives. None are torn from their families in the wild. Ringling Bros has an elephant preserve in Florida, it has berths for about 26 endangered Asian elephants, and says it will take in 13 of the circus elephants when they are retired from the circus. If they could not afford to keep their circuses running, why would anyone believe they can commit to feeding an unlimited number of elephants for decades at a cost of many millions of dollars? The company is not a non-profit organization. There is no more “wild” or “nature” for the Asian elephants to live, climate change, poaching and human development have destroyed their habitats. Circus work and other existing work in Asia was perhaps the best chance for this species to remain alive and among people, with whom they have worked for centuries, sustaining the lives of both. 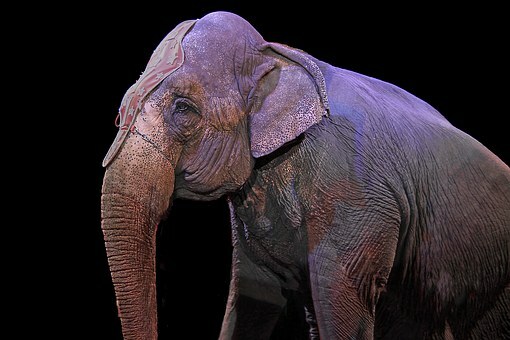 The Asian elephants in circuses, like the big carriage horses, have never lived in the wild and could not survive there. They are domesticated animals, they have worked among people for thousands of years. Speaking for myself, I can’t quite grasp the point at which entertaining and uplifting human spirits – something animals have done since the dawn of time – has become a crime, punishable by jail. Who else is supposed to lift us up and make our hearts sing the way animals do – Twitter? CNN? Facebook? Fox News? Who will bring the magic back and fill the holes in our hearts? In addition, the charges of abuse against Ringling Brothers are problematic. No court has ever found Ringling Brothers guilty of systematic abuse of elephants, especially in recent years, when there was so much monitoring of the circus and the elephants by government agencies and veterinary groups. The company was harassed out of business, it was never convicted of animal cruelty or systematic wrongdoing. The Feld family spent what one Wall Street analyst said was an “insane” amount of money defending themselves against scores of lawsuits brought by animal rights groups with the support of a lazy media, and easily purchasable politicians. The circus won every one of these lawsuits, they just became too expensive to fight. The movement that struck them down does not concern itself with truth or justice, they pay no attention to courts. Many of the people gloating over the demise of the circus and cheering it on simply do not know what they are talking about. I wish there was a gentler way to put it. Our culture worships opinions, but has abandoned facts. The animal rights movement now has one overarching idea about animals. Take them away. From cities. From carriage drivers. From farmers. From old and poor people. From circus trainers. From pony ride operators. From people without money or fences. They never seem to want to keep them here or bring them back. They and many of their supporters seem devoid both of empathy or concern for the human beings (and animals) whose lives they disrupt, and sometimes destroy. I cannot fathom how one can love animals and use that love to hate people. Eva Hughes is a life-long defender of the carriage horses in New York, she has nearly exhausted herself and her health fighting for the carriage trade, she is also a formidable thinker. She grasped the fact that the carriage horse conflict in New York was the beginning of a new social awakening, a new and wiser way of understanding animals, a turning point. The assault on the carriage trade was a spectacular and visible failure for this movement, perhaps its first on that scale, and in our biggest city. The people of New York totally rejected the ludicrous and unsupported idea that carriage work is abuse for working animals, or the claim that the horses were being abused. They understood the importance of keeping the horses in the city, where they could be seen. Hughes also, like Megan O’Malley, sees that this is not simply another issue for people to argue about endlessly, but something much more. A way of life, a kind of freedom is very much at stake. Americans, of all people, should care about that, it is at the very heart of our idea of liberty. Must we all work in giant towers in jobs we dislike for people who care nothing about us? The people who work with animals love their work, it is a calling, not a job. There is a growing movement in America – I am proud to be a small part of it – to save the domesticated animals of the world and keep them among us. To treat them and their people with respect and dignity. I think the horses started it, they demanded to stay with people, their destiny. A part of this movement is to recognize that most people who live and work with animals love them in a very particular way – pony ride operators, homeless people with dogs, farmers, carriage drivers, circus workers. We see for ourselves that very few of these people chose a life and lifestyle with animals in order to torture or abuse them. We do not rely on outside organizations to tell us what to believe about what other people are like, or about animals and their needs. They don’t know. We look outside of our windows. People who work with animals invariably come to love them and care for them in a way most people cannot even imagine. And she might well have asked. Why is that these people who profess so loudly and righteously about their love of animals and elephants don’t really care about the heartbreak and the loss? And there is much loss. This is a sad story to write about. If you ever took the trouble to see a carriage driver with his or her horse, or a circus trainer with their elephants, or a farmer with his or her cows, this love of animals would be instantly apparent to you. Abuse is real, and it exists, but it is not the entire prism through which we can understand animals or make wise decisions about their lives, that is a very small part of the picture. Like the carriage horses, the Asian elephants were in the safest and best possible place for them to be on this earth. They have not been rescued, they have been stolen, ripped from their lives and taken to a different kind of captivity. A much more dangerous kind, as will soon enough be clear, if the legions of the righteous are still paying attention. I am drawn to a life with animals and the task of writing about them in part because I believe most animal lovers have open hearts and generous souls. Animals have shown me how to love people, not how to hate them or persecute them. I will never exploit them by using them to make me feel better, my job is to understand them and give them what they need, not what I need. To love an animal is to learn love and empathy, and it was shocking to me that not one of the many people squawking about my post yesterday expressed one word of empathy or concern for the devastated and frightened circus workers, who took loving care of their elephants and also entertained so many of us for so long. People of good conscience can and should disagree, but the lack of empathy is the hall-mark of the sociopath, not the animal lover. Our divisive culture seems to be breeding legions of people who can sympathize with ideology but not human beings, with allegedly abused animals, but not the people who keep them alive. There is no love or humanity in that. What kind of animal welfare movement cannot care about the people who know animals best and are essential to their survival? The circus tragedy reminds us once more that animal rights movement has become a soulless and increasingly cruel movement. They have abandoned truth or reason and talk only to one another. They have done nothing to protect animals or keep them in this world, or save them from the worst cruelty, that of the giant factory animal farms. Not one official from PETA, the A.S.P.C.A. or the U.S. Humane Society has uttered a single word of concern for the many hundreds of people whose joy and work and even their homes have been unjustly taken from them. I have never met a carriage driver or a circus worker without heart or soul. They are not saints, they are human. The many good people cheering the demise of the circus will have a lot of elephant blood on their hands, and great damage to many innocent lives.The loss of this way of life is a loss for all of us, and for our freedom and dignity. I think the last and most eloquent words belong to Megan O’Malley, a natural writer I suspect we will be hearing from her in the future. I hope she writes a book. This story could use a dose of truth. It is an American tragedy that the Megan O’Malley’s of the future will not have this choice, this option, this opportunity. They will, like the children of America, have to get the magic of the circus and the elephants from You Tube or Facebook instead. The elephants will also lose their safe and good way of life, although many people can’t see it. That is a cold, cold, exchange.